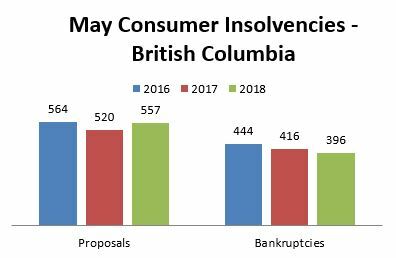 There were 953 consumer insolvency filings in British Columbia (BC) during the month of May this year, compared to 936 in May of last year. This is a 1.8% increase and it is the second consecutive monthly year-over-year increase. In fact, with 953 insolvency filings in BC, it is the second highest number of filings in the previous two years. Although it may be too early to make a call about a shift in the two-year trend of declining insolvency filings, the most recent two months seem to indicate that the declining numbers may be behind us. It seems that the trade disputes with the United States (US) have gone from bad to worse over the last month. Canada was recently excluded from North American Free Trade Agreement (NAFTA) negotiations as the US continued to negotiate with Mexico. More recently, the US has even gone as far as linking Canadian lumber exports to the wildfires happening in California. The Bank of Canada (BOC) met in July to increase interest rates and they will meet again in September. As inflation is starting to increase, so too is the likelihood that the BOC will increase interest rates again when they meet in September. Higher interest rates will continue to put pressure on the overly indebted Canadian household. The negative trends continue in the housing market, as reported in July by the Real Estate Board of Greater Vancouver. Detached home sales declined by 33% when compared to July 2017, and apartment and attached properties decreased by 26% and 35% respectively. Total sales were 29% below the 10-year average for the month of July. Although property sales are generally slow during the summer, the overriding trend of sluggish sales continues to prevail. As real estate, and related services, represent 18% of BC’s economy, a slow-down in this sector will invariably impact people’s financial situations. Try our debt calculator to assess your different options for paying down your debts. If you’re unable to see an end and are feeling hopeless when it comes to getting ahold of your finances, it may be an appropriate time to file a consumer proposal with a Licensed Insolvency Trustee.